Urinary incontinence is the inability to control one's bladder. The severity of this symptom can vary from woman to woman. Some women may experience occasional trickles of urine when bursting into laughter or while having a sneezing episode. Others might notice larger amounts of urine and more frequent uncontrolled urine flows that don't seem to be stimulated by laughter or a body-shaking sneeze. Although many women experience incontinence as they approach menopause, it isn't an inevitable aspect of getting older. Nonetheless, understanding this symptom can help prevent or treat it. Continue reading to learn everything about incontinence, including its causes, risk factors, symptoms, prevention, and treatment options. Eighty-five percent of the approximately 13 million Americans who suffer from incontinence are women. Stress urinary incontinence is the predominant form of incontinence among women. 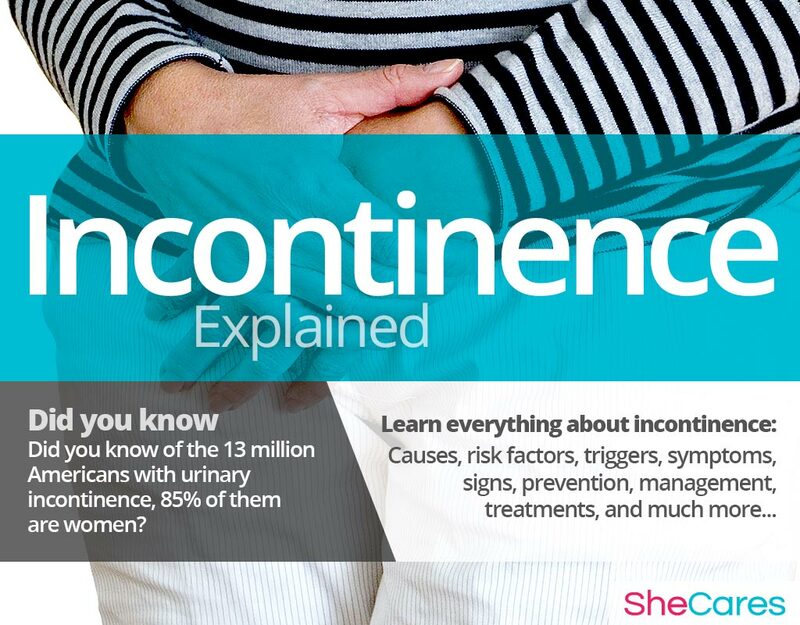 More than 40% of women suffer from incontinence at some point of their lives. Urinary incontinence is the loss of bladder or bowel control. Bladder control problems can occur when muscles are extremely weak or overactive. If bladder muscles are weak, you may have accidents while laughing or trying to lift something heavy. On the contrary, if these muscles are too active, then you may have a considerable urge to urinate even when your bladder is nearly empty. Additionally, incontinence may be caused by problems or damage to the nerves that control urination or within the urinary tract. Incontinence may be noticeable around particular stages of a woman's life; it is a very common symptom of pregnancy, menopause, and postmenopause. Women begin producing less estrogen during menopause, and this hormone helps keep vaginal tissues, including the lining of the bladder, healthy. Decreased levels of estrogen can sometimes cause tissues to deteriorate which may worsen incontinence. If it begins to affect a woman's daily activities, it is best to see a doctor to treat the underlying cause of urinary incontinence. It is often difficult to distinguish between the various types of incontinence because incidents can vary from person to person. Urinary incontinence is not gender specific as it can be symptomatic of underlying problems in both men and women. There are three main types of incontinence: stress incontinence, urge incontinence, and overflow incontinence. It is important to understand the origins of incontinence. Continue reading to learn about the hormonal and non-hormonal causes of this condition. Gaining knowledge of the causes of incontinence provides the key to understanding how to prevent and treat these inconvenient incidents. While the causes on incontinence can vary, it is typically caused by a hormonal imbalance in women, specifically decreased levels of estrogen. Estrogen helps to keep a woman's muscles strong, even the muscles that enable her to maintain control of her bladder. Estrogen also contributes to the health of the urinary tract lining. Keep reading to learn more about both the hormonal and other causes of incontinence. Hormones are chemical messengers that control every organ in the body. So, when changes in these hormone levels occur, certain health disorders can arise. Medical researchers have found that fluctuating levels of hormones, especially decreases in estrogen, make women more susceptible to incontinence. This is because estrogen is required to keep pelvic tissues healthy. So, during times of significant estrogen shortages - menopause and postmenopause - women are more susceptible to weakened pelvic floor muscles (that support the bladder and the urethra), causing problems controlling urine flow. Furthermore, there are also specific causes according to the stage of a women's reproductive life in which this symptom appears. These specific hormonal causes, combined with other factors, can influence a woman's individual experience of incontinence. Puberty is the stage in which a girl's body begins to produce reproductive hormones; these and other factors, such as birth defects or slower physical development, can contribute to incontinence during puberty. Pregnancy leads to extreme changes in the production of reproductive hormones, which along with other factors, like bodily changes and weakened muscles, can lead to incontinence. Post-partum and breastfeeding is another stage where reproductive hormones are imbalanced, and bodily changes can result in incontinence. Factors that contribute to incontinence in post-partum include nerve damage, organ movement, and episiotomy procedures. Menopause is the natural decline of reproductive hormones that signals the end of a woman's fertility. As well as hormonal causes, other factors add to the reasons for incontinence during menopause, including an estrogen deficiency. 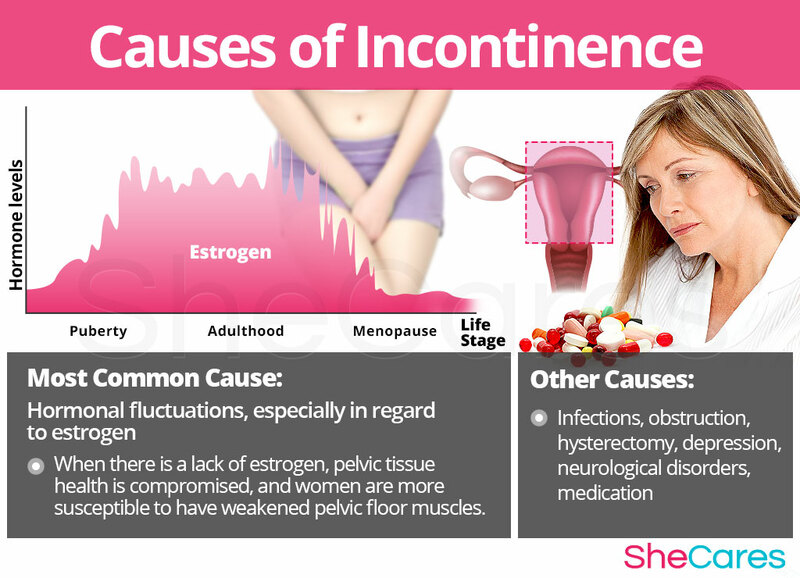 While hormonal imbalance is a noteworthy underlying cause of incontinence during a woman's life, experts also assert that it may be caused by other, less common, underlying conditions, including infections or neurological disorders and as a side effect of certain kinds of medication. Infections. Infections often irritate the bladder and result in incontinence. Incontinence is often the most common indicator of urinary tract infections (UTIs). Obstruction. A tumor in the urinary tract or urinary stones may block the normal flow of urine and cause incontinence. Hysterectomy. Due to the location of the bladder and the uterus, any surgery involving the female reproductive organs can damage the pelvic floor muscles that support the system. The damage of these muscles can result in incontinence. Depression. This is another serious disorder in which medical intervention is often necessary. Surveys have shown that women with incontinence were more likely to be depressed than those without it and vice versa. This is twice as likely in the case of younger women. Neurological disorders. Strokes, brain tumors, spinal injuries, multiple sclerosis, and Parkinson's disease can affect the nerve indicators that control bodily functions like bladder control. Medication. Some diuretics and tranquilizers can cause incontinence. Continue reading to learn about the risk factors and triggers that have a significant effect on a woman's experience of incontinence. Some women are more likely than others to suffer from incontinence for inherent health reasons - such as obesity, kidney disease, or diabetes. These predisposing factors can affect a woman's hormone levels and increase the chances that a woman will develop incontinence at some stage in her life. Obesity. In overweight persons, additional pressure is placed on the bladder and the nearby muscles. This pressure can result in weakened muscles and urine leakage. Other medical conditions. Kidney disease and diabetes can put an individual at greater risk of developing incontinence. Incontinence can also be triggered by certain behavioral habits. Avoiding these practices as much as possible may help to avoid the onset of incontinence. These include habits like smoking as well as other external triggers. Smoking. Many smokers experience persistent coughing. Such a cough places increased pressure on the urinary sphincter and can lead to stress incontinence. Continue reading to discover the symptoms and signs of incontinence to be able to choose a treatment specific to its cause. Incontinence is a symptom in and of itself. It can be caused by a hormone deficiency, underlying medical conditions, physical problems, or everyday habits. 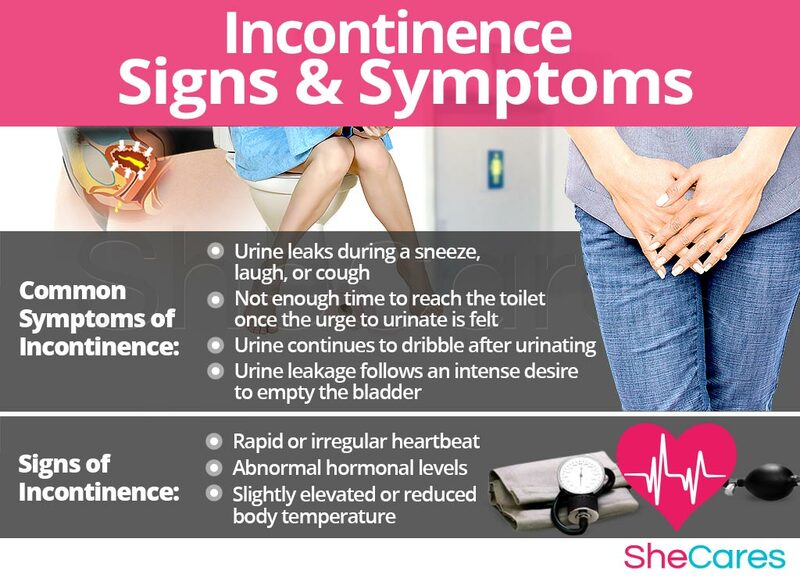 There are also medical signs of incontinence that can be assessed by a doctor. Continue reading to learn more about the indicators of the different kinds of incontinence. Further details concerning the testing process and diagnosis of incontinence will also be outlined. Estrogen imbalance: Estrogen assists in keeping the muscles that control a woman's bladder strong and her urinary tract healthy. So, monitoring these levels may indicate incontinence. Additionally, some hormone imbalances, such as those during menopause and postmenopause, temporarily disturb estrogen production and can cause incontinence. To diagnose and identify incontinence, doctors must typically perform the following procedures. First, review the patient's medical history and bladder diary. Then, they will proceed to conduct a physical exam and most likely order some additional tests, like a urine analysis and a blood test. Incontinence can be a natural part of the changes associated with a woman's reproductive life. However, incontinence caused by a hormone deficiency can interfere with a woman's quality of life. Some complications of incontinence include skin problems, urinary tract infection, and changes in various aspects of life. 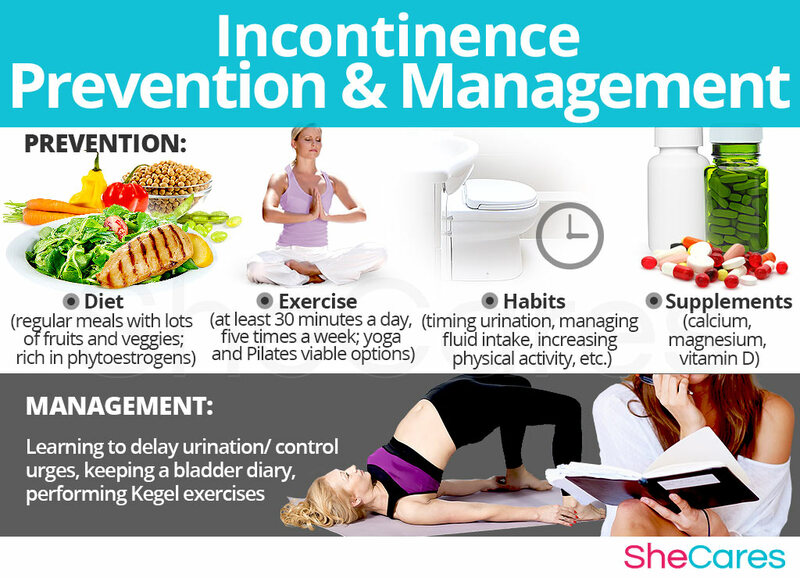 It is essential to learn more about the management, prevention, and treatment of incontinence. This information can prove invaluable in coping with these challenging times. Continue reading below to learn more. There are many natural ways to enhance bladder control, such as bladder training and pelvic floor exercises. Not only can pelvic floor exercises improve bladder control, but they can also support sexual health and pleasure. Strengthening these muscles can physically support the bladder and help counter incontinence. There is no single way to avert natural hormonal processes, and, similarly, there is no means of completely preventing incontinence. However, there are a few steps that a woman can take to decrease her chances of developing this condition, or to minimize the severity or frequency of incontinence episodes. Lifestyle changes for prevention are extremely important, especially with regard to diet, exercise, and healthy habits. A woman may seek ways to complement these lifestyle approaches with the use of supplements that help enhance the endocrine system and, therefore, help prevent or relieve the symptoms of hormonal imbalance, such as incontinence. For women who are already experiencing incontinence, prevention may not be possible. Fortunately, there are methods to manage these instances in order to avoid or reduce the intensity of the symptoms. Continue reading to learn about the different ways to manage incontinence. There are effective ways to instantly manage incontinence wherever a woman happens to be when recognizing the imperative urge to urinate. Making small adjustments to everyday life and avoiding triggers can make a huge difference in women who are trying to manage incontinence. There are general tips that women of all ages can use, such as learning to delay urination, keeping a bladder diary, or performing Kegel exercises. Alternative treatments are another excellent way to manage incontinence. These treatments will not address the hormonal cause behind most women's incontinence, but they are effective in reducing the physical symptoms in the short and medium term. Alternative treatments include acupuncture and biofeedback. While these measures often help to reduce the frequency and intensity of incontinence episodes, they are unable to treat the root of the problem, which, in many cases, is hormonal imbalance. However, there are several natural treatments that can treat the hormonal causes of incontinence. Continue reading to discover approaches to treatments for incontinence. Kegel exercises are one example of a natural treatment for urinary incontinence. These exercises help by strengthening the pelvic floor muscles, thereby supporting the bladder. It is important to target the underlying cause of the incontinence. For more natural treatments to manage urinary incontinence, check out this article. These natural ingredients can be taken in a number of forms, depending on which you find to be the most effective and convenient. While teas are a popular form of herbal remedies in general, they may not be suitable for those who suffer from incontinence, as additional fluid intake may increase urination frequency. Incontinence, a fairly common consequence of hormonal imbalance, can be frustrating and embarrassing for any woman who experiences it; however, some cases of incontinence are so severe that they begin to interfere with daily life. Fortunately, it is more than possible to find an effective treatment for incontinence. Three levels of approaches can be considered for treating incontinence. These are categorized as: (1) Lifestyle Changes, (2) Alternative Medicine, and (3) Pharmaceutical Options. Women are encouraged to begin with the least risky approach to incontinence treatment, lifestyle adjustments, and then proceed to the next level of care. 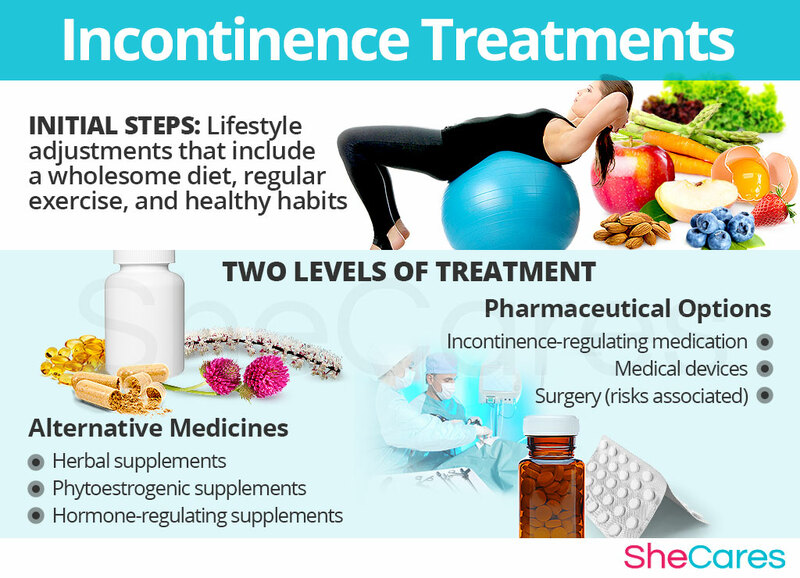 While medical intervention is not usually necessary to treat incontinence, some women who are unable to find relief from lifestyle changes and alternative medicine may wish to consider pharmaceutical options after properly assessing the risks associated with such a treatment. This primary level of treatment involves the least amount of risk, though, conversely, it requires the highest amount of discipline. Often simple changes in lifestyle can reap huge benefits in fighting incontinence and achieving improved health overall. Fundamentally, an improved diet, regular exercise, and healthy habits can do a woman great service. While these changes will help alleviate incontinence, they do not directly address hormonal imbalance - the most common cause of incontinence. So, further treatment may be necessary. Alternative medicine has proven to be an excellent way of treating incontinence related to hormonal imbalance in a safe and natural way. Alternative medicines and supplements involve little to no risk and can be an extremely effective way to treat incontinence. In the case of herbal supplements, there are two main types that can be used: phytoestrogenic and hormone-regulating herbal supplements. These supplements, such as black cohosh, contain estrogenic components produced by plants that complement the low estrogen hormones in a woman's body, helping alleviate incontinence. By introducing plant-based estrogens into the body, these herbs treat the underlying estrogen deficiency behind some cases of incontinence. They are mainly effective for menopausal women who are more likely to have low estrogen levels but are not necessarily effective for women in other stages of life. These supplements, including Macafem, stimulate the body's natural hormone production by nourishing the pituitary and endocrine glands, helping the whole hormonal system produce hormones more efficiently. This ultimately results in balancing not only estrogen but other important hormones, such as progesterone. These supplements can be considered the safest and most natural way to treat the underlying hormonal imbalance behind relevant cases of incontinence and can be taken throughout a woman's life as they support the body's natural hormone production. Additionally, there are some other types of supplements that can also alleviate incontinence, or at least make these incidents more manageable, including drinking green tea and taking a St. John's wort supplement. A combination of approaches is usually the most effective route to take. Lifestyle changes combined with alternative medicine will most likely be the best way to alleviate the symptoms of incontinence. However, for some women, the symptoms will be so severe that a more drastic treatment is necessary. Interventions at the third level involve the highest risk and often the highest costs. Not all treatments are suitable for women at every life stage. So, it is strongly recommended to speak to a licensed healthcare practitioner before starting any pharmaceutical treatments for incontinence. There are two main types of pharmaceutical options that can be prescribed to treat incontinence: hormone-regulating medication and incontinence-regulating medication in addition to specific medical devices.